Some hairstyles already have names and you just can't change them. Like blackeyedsue says, Indian braids are perfect summer braids! It was pirate day today and these were perfect to go under the bandanna. I just part her hair down the middle and braid each section of hair. I braid under, rather than over, because I like how it looks at the top of the braid. And of course I tie ribbons at the bottom of the braids, and curl the hair that's left out. Sorry about the shadows on the pictures! oops. 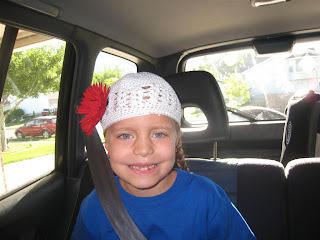 We also do these when she wears her crocheted hats. One of our very favorite "stand-bys." And I love the crochet hat look! I wonder if my girls would wear it? oh my heck! How I wish that I could do those styles. No-it's not that you don't give fantastic turotials-I have 3 little girls all with hair-but the longest is barely shoulder length. She has been growning it out from a stack, so we still have some flywaways. So-I was wondering if you could maybe borrow a neighbor or a friend with short hair and show a couple of short hair versions of your super cute styles! BTW-how long does it take you to do each "do"-that would be a great do. If you would post the estimated time to do it. Then we could figure if pir girls would sit through it. :_) Did I mention that I love your site. Did I mention that u were talented? Just checking! Come on by adn say hello-love to make new friends!! I just bounced over from she does hair blog and love having all these resources and pictures to go by! Thanks for your efforts!! I love the tutorials and will visit often. My daughter has shoulder length hair, but our problem is that its SO thin. I try to do braids but its so fine and thin it just falls out. What products do you use?